The name of Orion is today most closely associated with the famous constellation, but as with most of the famous constellations there is an origin myth from Greek mythology; for Orion was a hunter placed amongst the stars by the goddess Artemis. The story of Orion was one widely told, and retold, throughout Ancient Greece, and so names, places and other details vary between versions, with different regions of Greece claiming the original tale for themselves, but a basic outline of the story of Orion can still be ascertained. The earliest traditions simply name Orion as the son of Poseidon and Euryale (a daughter of King Minos), but a later myth gives a more fantastical version of the myth. One day the gods Zeus, Hermes and Poseidon decided to visit the royal court of King Hyrieus in Hyria, Boeotia. Hyrieus was the son of Poseidon and the nymph Alcyone, and was one of the wealthiest kings in all of Ancient Greece. Hyrieus gladly welcomed the three gods to his home, and laid on a sumptuous banquet where a whole bull was roasted for the deities. More than satisfied with the welcome they had received, the gods decided to grant Hyrieus’ greatest desire, and what Hyrieus wished for above all else was to have a son. Zeus, Hermes and Poseidon took up the hide of the bull that had been cooked for them, and then urinated on the hide, before burying it in the earth. Hyrieus was then instructed to dig it up at a later date, and when the king did so, he found Orion had been born. In either case, the role of Poseidon in the birth of Orion, gave him special abilities, for he was said to be gigantic in stature, and with the ability to walk on water. Additionally, Orion was said to be the most handsome of all earthborn men. As an adult Orion arrived on the large of Chios, and there fell in love with Merope, the daughter of King Oenopion. To prove his worth, Orion set about hunting down the animals present on Chios, and even became the first to develop the skill of hunting at night to bag a huge collection of animals. It did not matter what he did though, King Oenopion had no wish to see Orion become his son-in-law. A frustrated Orion would take matters into his own hands, and forced himself on Merope; Oenopion then sought retribution. 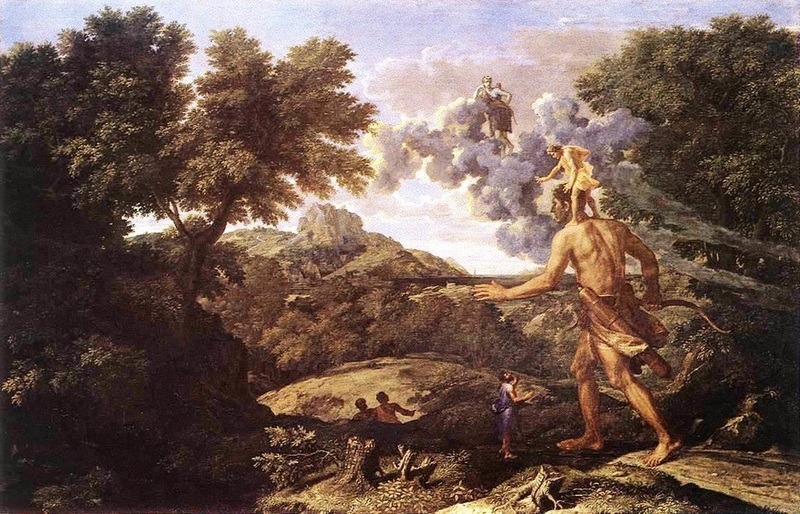 Oenopion gained the assistance of Dionysus, his father-in-law, and Orion was placed into a deep sleep, at which point the king blinded the giant. The blind Orion was then abandoned upon one of the beaches of Chios. Orion found out though that his sight could be recovered if he faced the rising sun at the eastern extremity of the earth. The blind Orion though had no way of knowing exactly where this point was, but hearing the sound of the hammering from the forge of Hephaestus, Orion walked across the waves to the island of Lemnos, to seek the help of the metalworking god. Orion found his way into the workshop of Hephaestus, and there the sympathetic god, provided the giant with a guide, Cedalion. Cedalion sat upon the shoulder of Orion, and guided him to the spot where Helios rose each morning; and as the sun, emerged, so the sight of Orion was restored. ​Orion returned to Chios to seek out revenge upon Oenopion, but the king had been safely hidden away by his people, when news of the giant’s approach sounded. Orion therefore left Chios and made his way to another island, this time Crete. On Crete, Orion became a companion of the goddess Artemis, the Greek goddess of the hunt, and hunted with the goddess and her mother, Leto. Companionship of Artemis would ultimately lead to the death of Orion, although various different tales are told of how the son of Poseidon came to die. Version 1 - Orion boasted of his hunting ability and proclaimed that he would hunt every animal to be found on the earth. These words greatly upset Gaia (Mother Earth), who sent forth a giant scorpion to stop Orion. This scorpion would overcome the giant, killed by the poisonous sting. Version 2 - Eos, the Dawn Goddess, saw the handsome Orion in the company of Artemis, and decided to abduct the giant. Artemis though killed Orion when she found her companion with Eos upon the island of Delos. Version 3 - Artemis though was said to have killed Orion when the giant forced his attentions upon the Hyperborean maiden Oupis, a handmaiden of Artemis. Version 4 - Artemis killed Orion when the hunter had the affront to challenge her to a game of quoits. Version 5 - Apollo arranged the death of Orion when he became jealous of the closelness of Orion and his sister Artemis. When Orion was swimming far out to sea, Apollo challenged to hit a bobbing target, Artemis of course found her mark, unaware that it was the head of her companion. Orion was subsequently seen by Odysseus in the Underworld, for the Greek hero observed Orion hunting the wild beasts found within the realm of Hades. The likeness of Orion though was to be found in the heavens, for Artemis was said to have asked Zeus to place the hunter there. 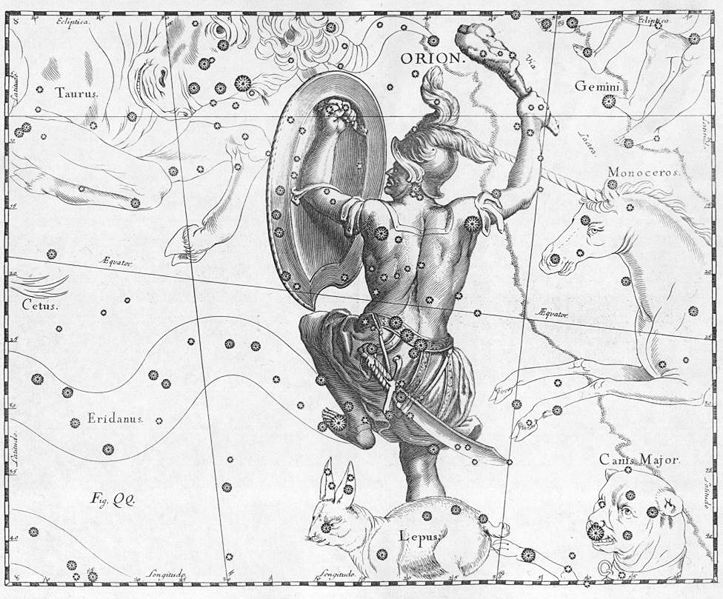 The constellation Orion though was also joined by Canis Major, a hunting dog to accompany Orion. Also in the heavens though was placed the Scorpion, Scorpius, although whenever Scorpius appears Orion hides away, for the two are never to be seen together. When it came to the chase it was not just animals that Orion pursued though, and Orion was know to be almost as lustful as Zeus. Famously, Orion sought to conquest each of the Seven Pleiades; to escape the unwanted attention the seven sisters were transformed into the constellation, although of course, even in the heavens Orion still chases after them. Orion was said to have had various offspring as well, and may well have fathered 50 sons by the daughters of the river god Cephisus. Famously, Orion was also father to two daughters by Side; these daughters were named Metioche and Menippe, named collectively as the Coronides. At a later date, Metioche and Menippe willingly sacrificed themselves to relieve the spread of pestilence across the land, and were subsequently transformed into comets to recognise their bravery.